SK Telecom (SKT) has unveiled a package of 5G wireless plans in a response to its archrival KT’s price-focused plan to take leadership in the fledgling 5G network market, claiming the fastest data speed and the availability of ultra-large volume content. 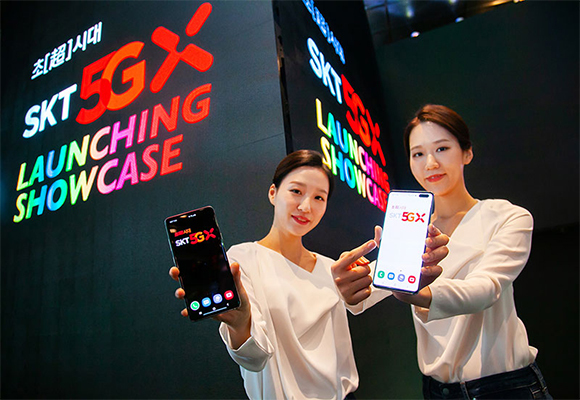 SKT, the biggest wireless carrier, said on Wednesday its 5GX service instantly converts a mode into 5GX Turbo to support up to 2.7Gbps data transmission speed, making it ideal for streaming and downloading ultra-large volume data like Harry Porte Augmented Reality Game. It takes only 36 seconds to download a 12GB virtual reality content over SK Telecom’s 4G-5G aggregated network, while it takes more than one minute to download the same content via 5G network alone. SKT’s 5G network is also designed to support services that require ultra-low latency such as smart factory and autonomous driving. The company also said the 5GX data speed will be upgraded to 7Gbps next year. SKT has secured the widest 5G network coverage in Korea with a total of 34,000 units of 5G base stations across the country as of 6:00 pm on Tuesday. The company has rolled out its 5G network in data traffic-concentrated areas, including main areas of 85 metro areas nationwide, universities, KTX stations and subway lines. It is now expanding in-building coverage in 120 department stores, shopping malls and airports. SKT also said it has secured the safest 5G network by applying quantum cryptography technologies to eliminate the risk of hacking and eavesdropping. SKT’s 5GX price plans consist of four different types. The Slim plan offers 8GB of data at 55,000 won ($48.45) per month and the 5GX Standard comes with 150GB of data at 75,000 won per month. Those who subscribe to 5GX Prime or 5GX Platinum plans until the end of June will be able to use unlimited data at 95,000 won and 125,000 per month, respectively.